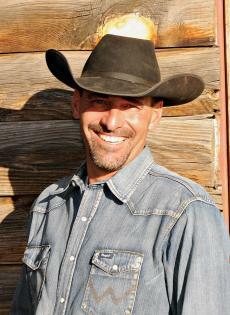 Barry Moffett is one of our most popular western horseback guides. He was born in Nevada, raised in Arizona and has been training and riding horses for 35 years, making him well-versed in the art of handling horses. Barry has competed for many years as a professional rodeo cowboy, taking numerous awards and accolades. Working with people and exploring the ponderosa pine forest of Arizona’s rim country are two of his favorite activities. Interviewer: What is it like competing in professional rodeo events? What was your role? Barry: I did 10 years roping professionally, traveling all over the country and made my living this way, competing in a lot of rodeos. I roped as the header of a team for the longest time. The header is the guy on one side of the steer and you have another guy who is the heeler on the other side. You have to give that steer a certain amount of head start, then the header rides out and ropes him around the horns to control him and then the heeler ropes him around the back legs. The whole process is timed with a typical run taking only 4 to 5 seconds – maybe 9 seconds for a longer run. Being a header requires a very, very fast horse! And it’s not always just one steer. To hit the jackpot, you have to rope three steers. My biggest winning was just under $13k. Interviewer: What sort of training did you get before competing professionally? Barry: Well, I went to college on a roping scholarship at Central AZ college in Casa Grande. I took a lot of small business classes, but all along I told myself, “I am going to rope for a living”. Interviewer: What advice do you give to new riders? For more info about our guides and practical riding technique please check out other blog posts as well as sections of this site.